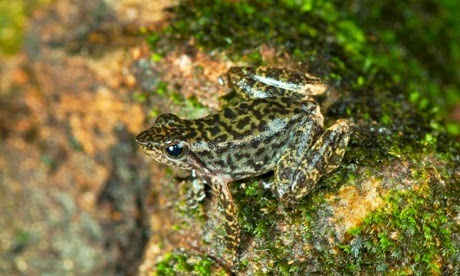 Scientists have discovered 14 new species of so-called dancing frogs in the jungle mountains of southern India. Indian biologists say they found the tiny acrobatic amphibians, which earned their name with the unusual kicks they use to attract mates, declining dramatically in number during the 12 years in which they chronicled the species through morphological descriptions and molecular DNA markers. They breed after the yearly monsoon in fast-rushing streams, but their habitat appears to be becoming increasingly dry. "It's like a Hollywood movie, both joyful and sad. On the one hand, we have brought these beautiful frogs into public knowledge. But about 80% are outside protected areas, and in some places, it was as if nature itself was crying," said the project's lead scientist, University of Delhi professor Sathyabhama Das Biju. The study listing the new species published Thursday in the Ceylon Journal of Science brings the number of known Indian dancing frog species to 24. They're found exclusively in the Western Ghats, a lush mountain range that stretches 1,600 kilometers (990 miles) from the western state of Maharashtra down to the country's southern tip.